This investment is part of China's “One Belt, One Road” initiative, which is a global project in character and scope representing China’s inexorable rise on the world stage as a superpower. 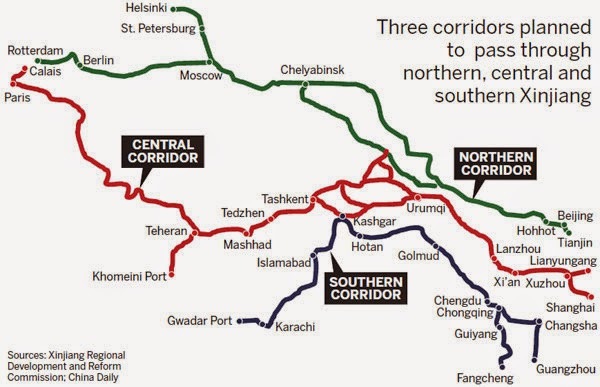 The Pakistan part of it is variously described as Pakistan-China "economic corridor", "industrial corridor", "trade corridor" and "strategic corridor". Chinese and Pakistani naval forces have also agreed to boost maritime security cooperation in the Indian ocean with the sale of eight diesel-electric AIP-equipped submarines capable of carrying nuclear weapons. This cooperation is aimed at defending against any threats to shipping lanes in and out of Pakistani ports serving the planned Pak-China Corridor. Russia, too, has lifted arms sales embargo on Pakistan and agreed to sell weapons and make energy infrastructure investments. Plans are in place for first-ever Pakistan-Russia military exercises. These development come on the heels of US President Barack Obama's second visit to India and Indian Prime Minister Narendra Modi's recent tour of Western capitals with the signing of deals confirming Modi's India's status as the West's latest darling. 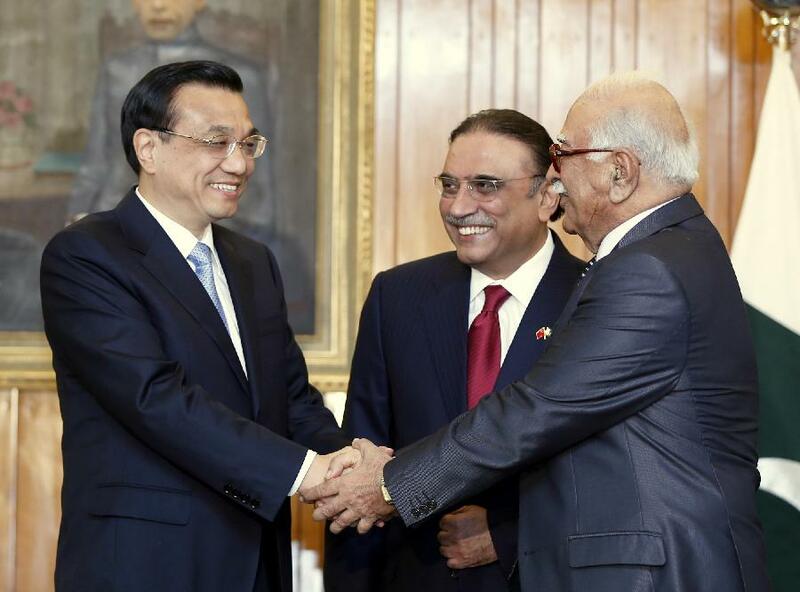 China's new Prime Minister Mr. Li KeQiang has just ended a two-day visit to Pakistan. Speaking to the Senate, Li declared that "the development of China cannot be separated from the friendship with Pakistan". To make it more concrete, the Chinese Premier brought with him a 5-points proposal which emphasizes "strategic and long-term planning", "connectivity and maritime sectors" and "China-Pakistan economic corridor project". As to the benefits for Pakistanis, the Chinese investment in "connectivity and maritime sectors" and "China-Pakistan economic corridor project" will help build infrastructure, stimulate Pakistan's economy and create millions of badly needed jobs. Both China and Russia have begun an all-out charm offensive to move the Pakistani government in their direction. 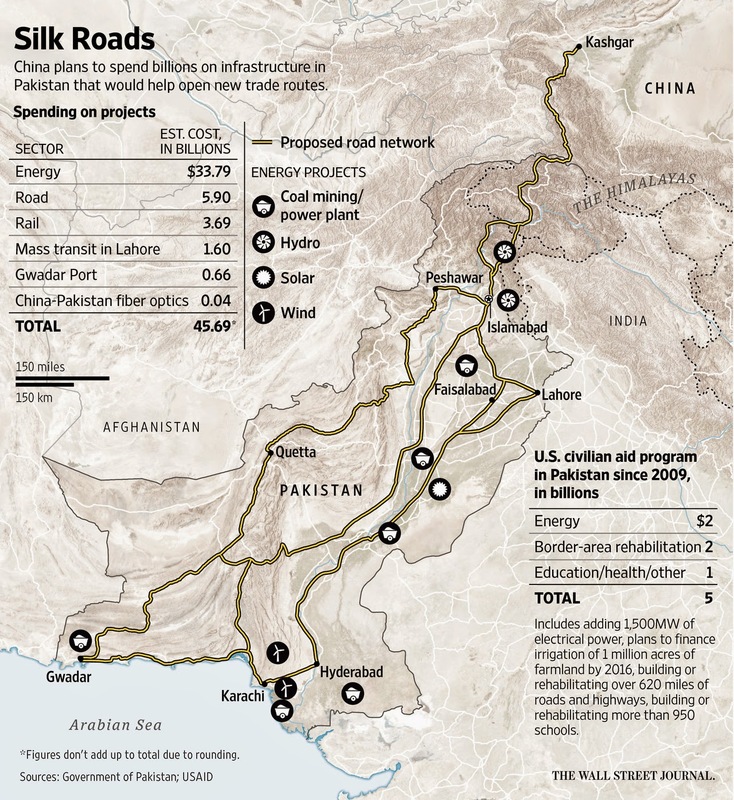 China certainly sees an opening in that part of Asia with the departure of the US military from Afghanistan; while Russia seizes on a much-needed market by committing $3 billion to build an LNG pipeline from Karachi to Lahore. ), in which Pakistan has a 9.51% slice. It (China-Pak Corridor) is an impressive proposal, on a scale that we've come to now associate with China's overseas footprint — more usually in corners of Africa. According to the BBC, the Chinese state and its banks would lend to Chinese companies to carry out the work, thereby making it a commercial venture with direct impact on China's slackening economy. The project is also a key cog in China's own grand-historic vision of itself as a global power and the font of new sea and land "Silk Roads." The China-Pakistan Economic Corridor would link up a major land route in Central Asia to what China imagines will be a key maritime hub at Gwadar. Sure, there remain real reasons to be skeptical. Much of the new construction would be done in the vast, restive Pakistani province of Baluchistan, where the army is still grappling with an entrenched separatist insurgency. Moreover, as Pakistani journalist and columnist Cyril Almeida points out, the proposed Chinese numbers stretch credulity, especially when set against the meager sums currently being invested from the outside into Pakistan's economy. The proof, in this case, will be in the building. China, Small suggests, "is finally easing into its role as a great power." And, indeed, it's using Pakistan as a corridor. China signed 51 agreements with Pakistan in a ceremony in Islamabad Monday that could ultimately lead to $48 billion in infrastructure projects. For now, $28 billion in spending is planned. China President Xi Jinping made his first state visit to Pakistan to unveil the development program known as the China-Pakistan Economic Corridor; it will include railway upgrades and power plant construction. China and Pakistan share a “mutual antagonism toward India, but their economic ties had lagged behind,” The Wall Street Journal reports. In February and March, the MSCI Pakistan Index fell by over 20% in dollar terms, and the 13% drop in March was the largest in five years, Renaissance Capital reports. But the MSCI Pakistan Index started to rebound this month, up roughly 9%. So far in April, the iShares MSCI Frontier 100 ETF (FM) is up 4%, the WisdomTree India Earnings Fund (EPI) is down 1.5%, and the iShares MSCI India ETF (INDA) has tumbled 2.6%. That unhappy history is too well known. After the attacks of September 11th, President and Gen. Pervez Musharraf was encouraged or bullied to join America in destroying Al Qaida then headquartered in and protected by Taliban-run Afghanistan. Afghanistan had always been of great strategic importance to Islamabad in part because it provided “strategic depth” in the event of hostilities with India and in part because Pakistan’s intelligence service, ISI, enjoyed influence over parts of the Taliban organization. It was naïve to think that Pakistan would alter those strategic interests for unlimited support of the U.S. war on terror. Until last year, Pakistan distinguished between “good (i.e. Afghan) and “bad (i.e. Pakistani)” Taliban by aiding the former while taking on the latter. Further, while the U.S. believed it was financially generous with coalition support funding for the Pakistan military in battling Al Qaida and later with the Kerry-Lugar-Berman Act that provided $1.5 billion a year for five years in assistance, Islamabad saw that aid as miserly coming from an economic superpower. Politically, because President Obama did not hold President Zardari in high regard, Army Chief of Staff Ashraf Pervez Kayani was treated as the de facto head of government bypassing civilian authority. Then, the case of CIA contractor Raymond Davis who shot and killed two Pakistanis and finally was freed with “blood money” paid to the victims’ families brought the relationship to its nadir. That nadir was eclipsed with Seal Team Six’s raid in Islamabad that killed Osama bin Laden conducted without informing the Pakistani government in advance. Exacerbated by drone strikes, positive Pakistani perceptions of America were measured in single digits. And the Obama administration’s decision to withdraw from Afghanistan leaving that country close to civil war was not calming to Islamabad. From Beijing’s perspective, Pakistan had been a long-term friend and potential strategic ally against India. More importantly, China understood that in the 1950’s and 1960’s, Pakistan had been a thriving economy and could become one again based in part by opening a new silk road connecting east and west and bringing China closer to the Middle East and Africa where its economic interests were rapidly expanding. 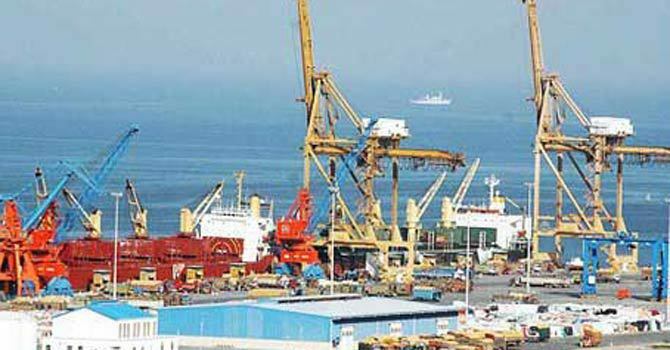 Developing the Pakistani seaport of Gwadar bordering on the Persian Gulf would be the logistical springboard for this link up. Stability in the region is dependent on a prosperous and stable Pakistan, a condition that is very much in doubt given current circumstances. Despite its efforts, the U.S. could not deliver on that promise. If China can, the region will be better off. Perhaps the wisdom of Sun Tzu can meet the vision of Pakistan’s chief founder Mohammed Ali Jinnah without alienating India. The U.S. should be very supportive of that prospect. That it will is very much in doubt. 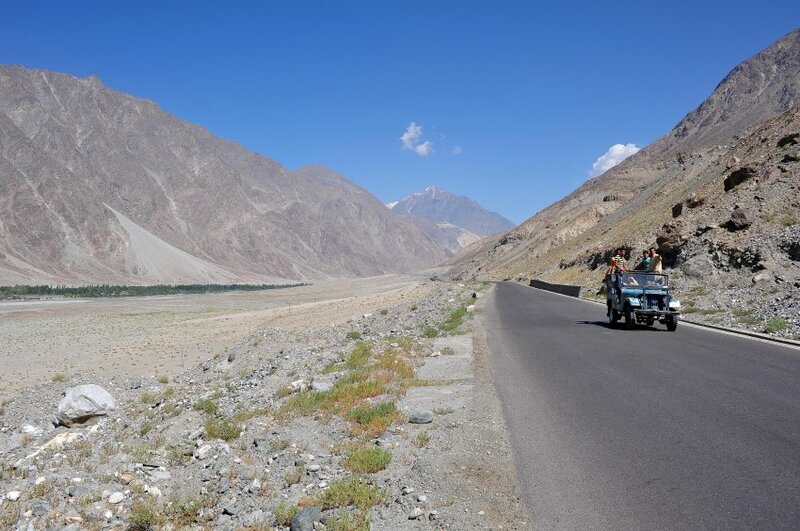 India and Pakistan, the newest prospective members of a growing economic club formed by Russia and China in the Eurasian region, have hailed the emergence of an economic axis not centered around the West. Indian Prime Minister Narendra Modi said at a summit of the Shanghai Cooperation Organization (SCO) in the Russian city of Ufa that the expanded group, which with the addition of India and Pakistan would represent half the world's population, will serve as a "springboard" to make Eurasia's economy one of the most dynamic in the world. Pakistani Prime Minister Nawaz Sharif said that Russian President Vladimir Putin's "efforts will enhance the political and economic scope of the Eurasian belt." Modi used the occasion of the summit to schedule a state visit to Pakistan next year, in a sign the two nuclear-armed rivals may see the economic group as a rare forum for mutual cooperation and an easing of tensions. "We have everything we need to succeed," Modi said. "The time has come to reach out across the region." Putin showed his pleasure at attracting some of the world's biggest emerging economies, and said that the new entrants would enhance the economic clout and reach of the organization. "These are powerful nations with strategic prospects, the future leaders of the world and the global economy," he said. "We will actively develop our relations with those who want to work with us," he said, in a pointed reference to the unwillingness of the West to do new business with Russia after imposing sanctions last year when Russia seized Crimea and backed a separatist rebellion in eastern Ukraine. "It has become clear that economics are being used as a political weapon.... But we should not close ourselves off with some kind of wall," he said. "We will use all the tools of collaboration with all countries -- the United States, Europe, and Asia." Putin used the Shanghai summit and a previous one involving the world's largest emerging economies to show that Russia is not isolated in the global economy, despite bickering with the West over Ukraine. Analysts said India and Pakistan likely wanted to join the Eurasian group to develop relations with major energy producers like Russia and Kazakhstan. The group also includes other Central Asian former Soviet republics Uzbekistan, Kyrgyzstan, and Tajikistan. "Membership could better position India to benefit from Central Asia's gas riches," said Michael Kugelman, an associate at the Wilson Center in Washington. But while the addition of India and Pakistan beefs up the group's economic gravitas, "India and Pakistan wouldn't be dominant powers" within the organization, he said. "China and Russia would retain that title." The Shanghai group did not invite Iran to join, although it has long sought membership. The group says Iran can join only after reaching a deal with big powers on its nuclear program. With the addition of Iran, the group would control around one-fifth of the world's oil and represent nearly half of the global population. The BRICS account for one-fifth of the world's economic output and 40 percent of its population. With Pakistan's good relations with both China and the U.S., it is ideally placed to help bring the two powers together, as it did in the past. It is sometimes forgotten that Pakistan facilitated President Nixon's historic visit to China. The current global geopolitical alignment for the first time in history has both the U.S. and China maintaining good relations with both India and Pakistan. While noting the unmistakable affection for Pakistan in China, I saw no overt signs of hostility towards India. On the contrary, Chinese scholars talked with optimism of the new relationship between China and India. They pointed to President Xi's visit to India and Prime Minister Modi's visit to China, which were conducted in an atmosphere of cordiality and resulted in billions of dollars in economic deals. But reality warns us that India and Pakistan are so conditioned by their hateful rivalry that they will turn any event to their favor and against their opponent. Perhaps the vast economic and political benefits that are possible in China's initiatives will influence them in this case. In spite of the numerous naysayers, those of us who dream of a peaceful South Asia taking its place on the world stage as a cultural and economic powerhouse see a ray of hope in today's situation. Perhaps the greatest lesson that emerged in the recent U.S.-China dialogue that I attended was the importance of face-to-face meetings with open minds and hearts and at convivial meals. Free from files and official agendas, people of different backgrounds see each other with empathy as fellow human beings. We are still left with Napoleon's enigmatic comment ( "When China wakes, she will shake the world"). The answer to the inherent question contained in it may be tied to Xi Jinping's vision of the future of China. In either case, it is time to watch the awakening of China with interest. 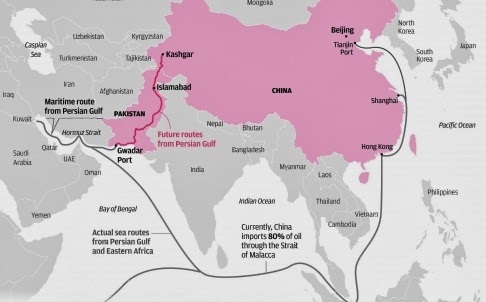 With U.S. sanctions easing, India is racing to build a port in Iran that will get around the fact that its land access to energy-rich former Soviet republics in Central Asia has been blocked by China and its ally Pakistan. While the world focuses on what Iran’s opening means for Israel and Arab nations, the ramifications are also critical for Asia. Closer Iran-India ties would allow New Delhi’s leaders to secure cheaper energy imports to bolster economic growth and reduce the influence of both China and Pakistan in the region. The six nations that make up Central Asia hold at least 11 percent of the world’s proven natural gas reserves, as well as substantial deposits of oil and coal, according to data compiled by BP Plc. Afghanistan says its mineral wealth is valued at $1 trillion to $3 trillion. India can be the first country to benefit from the deal in Asia, an Iranian diplomat told reporters in New Delhi this week. Iran was seeking billions of dollars in investment from India for ports, railways and airports, the diplomat said, asking not to be identified due to government rules. Even before the deal to end sanctions was clinched, India reached an agreement to upgrade the Iranian port of Chabahar on the Arabian Sea. Two Indian state-run companies -- Jawaharlal Nehru Port Trust and Kandla Port Trust -- have plans to invest $85 million to upgrade two berths. On a five-nation Central Asian tour last month, Prime Minister Narendra Modi backed an ambitious transit route through Iran that would effectively connect Europe to India by a series of sea, rail and road links. Currently, cargo from India has to go by air or take a detour through the Suez Canal. 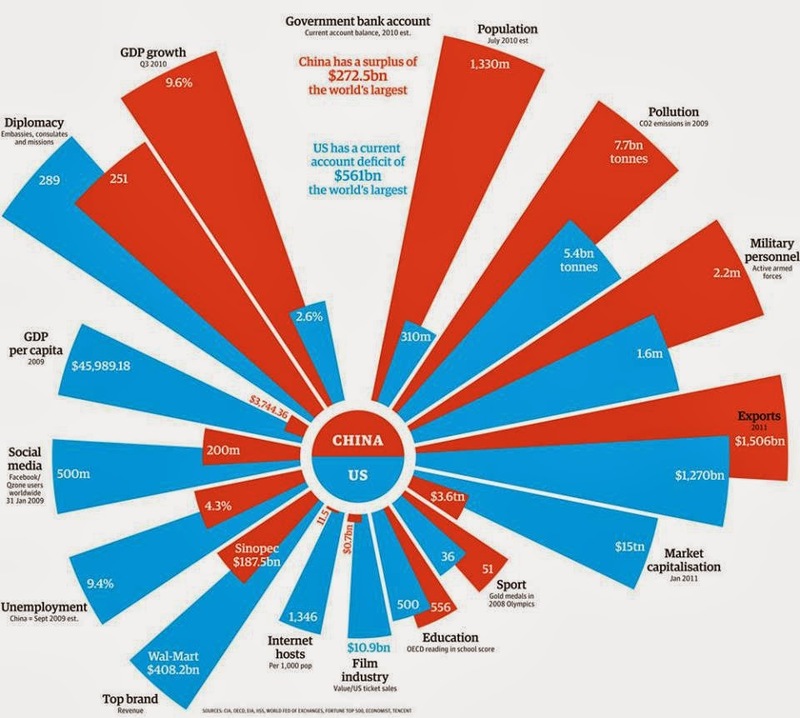 China is the biggest economic player in Central Asia. It’s the top commercial partner for every nation except Afghanistan, with its $48 billion in trade to the region dwarfing that of India, according to data compiled by Bloomberg. Turkmenistan pipes almost 80 percent of its gas to China. China has welcomed the nuclear deal, noting in a statement that Iran once played a pivotal role in the ancient Silk Road trade route linking Europe and the Far East. Pakistan is also important. The only Muslim-majority country with a nuclear bomb has refused to allow Indian trucks to pass through to Central Asia, and plans to build overland gas pipelines from Iran and Turkmenistan had long stalled. Even so, Pakistan doesn’t see much of a threat, according to Commerce Minister Khurram Dastgir Khan. China is investing $45 billion in an economic corridor through Pakistan stretching from China’s western border to the Arabian Sea. Pakistan is also seeking a free-trade agreement with Iran. “The scale of Chinese investment in Pakistan and in the corridor really dwarfs anything Indian is attempting in Iran,” Khan said in an interview in Islamabad on Wednesday. #Pakistan warms up to #Russia with helicopter deal, gas pipeline investment http://on.wsj.com/1J7dd0f via @WSJ Russia has agreed to sell military helicopters to Pakistan and is poised to build a $2 billion natural-gas pipeline in the South Asian country—its biggest investment there in decades—as Islamabad turns toward a former adversary and away from the U.S., its longtime ally. Islamabad has been weighing its strategic options amid rising tension with Washington, which views Pakistan as an unreliable ally in combating Islamist militants in the region, including neighboring Afghanistan. On Thursday, Pakistan said it would buy four Russian Mi-35 attack helicopters for an undisclosed price, after a spate of high-level visits between the two countries. In the Russian city of Ufa last month, Pakistani Prime Minister Nawaz Sharif met Russian President Vladimir Putin and declared that he wanted a “multidimensional relationship” encompassing defense, commerce and energy. That represents a major shift for both countries, in response to a changing geopolitical dynamic. Pakistan worked alongside the U.S. to defeat Soviet forces that occupied Afghanistan in the 1980s, while Russia built close ties with India, Pakistan’s estranged neighbor and rival. Now, the U.S. is increasingly embracing India as a counterweight to a rising China, which it views as a strategic competitor. That has encouraged erstwhile enemies Russia and Pakistan to mend fences. The biggest marker of this new relationship is a proposed 1,100-kilometer (684-mile) pipeline, to be built by Russian state-owned industrial conglomerate Rostec. The two countries are expected to sign an agreement to move ahead within the next month, officials from both sides said. The pipeline would carry imported natural gas from the port city of Karachi to Lahore in the east, helping the country deal with crippling energy shortages. Rostec, run by a close friend of Mr. Putin’s, would finance, own and operate the pipeline for 25 years. “It’s very important for Russia from a geopolitical point of view. Russia is trying to enter this market and compete with China and the U.S.,” said Vladimir Sotnikov, senior research associate at the Russian Academy of Sciences’ Institute for Eastern Studies. Despite Islamabad’s outreach to Russia, experts said it is likely to seek continued close ties to the U.S., which is Pakistan’s biggest supplier of military aid and equipment. Since 2002, the U.S. has provided Pakistan with $31 billion in civilian and military aid and reimbursements, according to the Congressional Research Service. Pakistan recently signed a nearly $1 billion deal to purchase 15 American AH-1Z Viper helicopters, as well as 1,000 Hellfire missiles and other equipment. Both Russia and China are concerned about protecting their southern underbellies against the export of extremism and instability from Pakistan and Afghanistan, by investing there to promote economic development. The Russian pipeline would represent Moscow’s first major project in Pakistan since the early 1970s, when the Soviet Union helped build a steel mill in Karachi during a brief warming of relations that followed the election of a left-leaning leader in Islamabad. The two countries are now discussing ways that Russia can upgrade the mill, Pakistani officials said. Rostec said it would raise the funds needed for the project. The U.S. imposed financial sanctions on Rostec after Russia’s interventions in Ukraine, effectively cutting it off from U.S.-dollar financing. MOSCOW (Sputnik) — The contract on the delivery of four Russian Mi-35 helicopters to Pakistan could be expanded, head of the Russian Foreign Ministry's Second Asia Department Zamir Kabulov said Tuesday. "It all depends on money. Pakistan has stated that it has the financial means for 10-12 helicopters of this type, but negotiations are ongoing," Kabulov told RIA Novosti. Moscow and Islamabad are discussing possible supplies of Russian defensive weapons to Pakistan, Kabulov added. "Pakistan has an interest in other Russian weapon systems. Negotiations are underway. We are talking about defensive systems," Kabulov told RIA Novosti. In March, Pakistani President Mamnoon Hussain announced Islamabad's intention to expand military-technical commerce with Russia with the purchase of Mi-35 gunships. In August, a contract for four Mi-35M transport and attack helicopters was signed by Russia's state arms exporter Rosoboronexport and Pakistan's Ministry of Defense, according to a spokesperson for the Russian Embassy in Islamabad. The Mi-35M (NATO Designation Hind-E) is an upgraded export version of the Mi-24V multipurpose assault helicopter, developed by the Mil Moscow Helicopter Plant. The US Department of Defense (DoD) has awarded Bell Helicopter a USD581 million contract that includes the delivery of AH-1Z Viper attack helicopters to Pakistan. The contract, which was announced by the DoD on 26 August but awarded the day before, covers the manufacture and delivery of 15 Lot 12 UH-1Y Venom utility helicopters, 19 Lot 12 AH-1Zs, one Lot 13 UH-1Y, and 21 auxiliary fuel kits for the US Marine Corps (USMC) and government of Pakistan. Pakistan requested the sale of 15 AH-1Z helicopters in April, and this announcement is the first official confirmation that a deal has been signed. While the notification does not say how many of the 15 helicopters have been signed for at this stage, it states that 10% (USD57.9 million) of the overall contract value covers the sale to the government of Pakistan. This suggests that this is an initial deal for the first two helicopters only, with contracts for the remaining 13 (plus spares and support) to follow. According to the DoD, these initial helicopters will be delivered by the end of August 2018. The original US Defense Security Co-operation Agency notification of Pakistan's request included 1,000 AGM-114 Hellfire II air-to-surface missiles for "a precision-strike, enhanced-survivability aircraft that can operate at high altitudes. By acquiring this [AH-1Z and Hellfire II] capability, Pakistan will enhance its ability to conduct operations in North Waziristan Agency [NWA], the Federally Administered Tribal Areas [FATAs], and other remote and mountainous areas in all-weather, day and night environments". The contract notification is the latest development in Pakistan's ongoing efforts to bolster its rotary-winged attack capabilities. As well as procuring the 15 AH-1Zs to bolster and eventually replace its existing 32 AH-1F Cobra platforms, Pakistan has also evaluated the Chinese CHAIG WZ-10 attack helicopters, which has included flying them operationally on counter-terrorism missions, and is rumoured to be interested in the Russian-built Mil Mi-28NE 'Havoc' as well. On 19 August it was announced that Pakistan and Russia had signed a formal agreement for the procurement of four Mi-35 'Hind' attack helicopters, with more likely to follow.